That is exactly what she has done in her book Final Gifts: Understanding the Special Awareness, Needs, and Communications of the Dying, (Simon & Schuster), which she co-wrote with her hospice nurse colleague Patricia Kelley. Recently, Callahan came to JourneyCare to share these stories and help our valued team members explore how to respond to the dying in new and authentic ways. The book is a must-have resource for family members and friends who want to better understand what their loved one is going through during the final stages of their illness. It is comforting and helpful, and a practical guide we encourage those seeking further understanding to read, even if they only have time for bits and pieces. 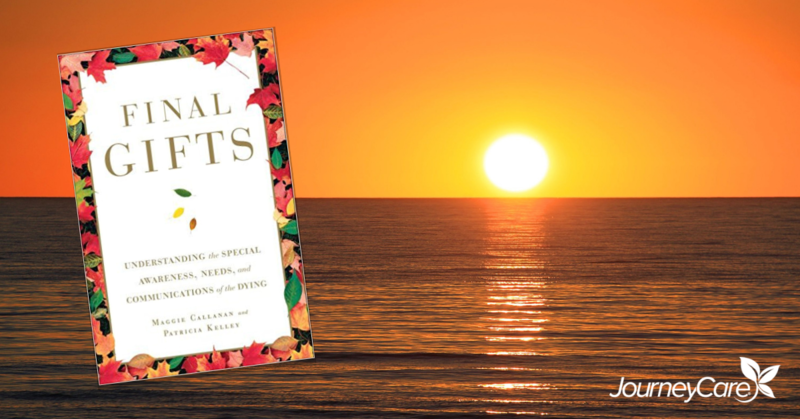 Final Gifts contains many insights, including the wisdom that dying people can be quite clear about their needs, but they may be hard for caregivers and family members to read because they may also be opaque and symbolic. The authors suggest keeping a notebook for everyone at the bedside to use, where they can write down what they hear and see and, together, they can better understand what their loved one is trying to communicate. They advise caregivers: “Remember that there may be important messages in any communication, however vague or garbled.” These hints can help loved ones respond to the requests of the dying and help them prepare emotionally and spiritually for the death. Most importantly, Final Gifts shows how all of us can help our loved ones live fully to the very end. It is a manual to help us discover the gifts – the wisdom, faith and love – that the dying leave their loved ones to share.